I’m so glad we have the NEWS THREAT LEVEL system in place. Now I can post crap like this and not feel an ounce of guilt, even though it is a total and complete waste of time! Woo! This is actually game-related, in a way. It’s about the Excellent Game Psychonauts, and also about how children are our future, too. And cat pee. There’s a little cat pee at the beginning. I advise you not to read this. Tasha is game-related as well, because she works here, on our game. And she’s in the story. She starts this whole chain of events, in fact, by selling me this horrible, stupid thing called a Litter Robot. The Litter Robot is supposed to use robotics and future tech to neutralize cat box problems. Cats are supposed to enter the Litter Robot pod, turn around, and relax their tiny colons and void their GI tracts inside the robot’s Privacy Module. Then the Little Robot beams the waste matter into the future, where, hopefully, science has figured out a way to turn cat feces into gold or food. But enough about cats. 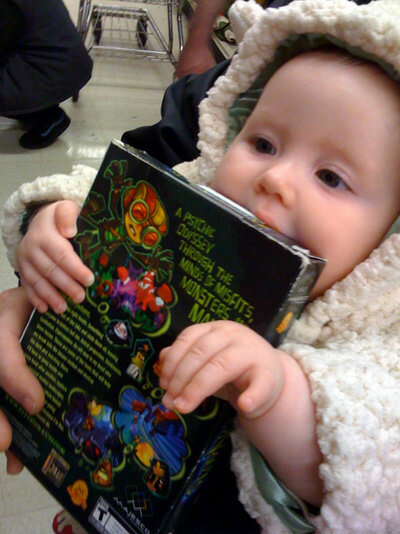 Let me get to the part of the story that is about Psychonauts, and my genius daughter. My brilliant idea: I need to get some sort of motion-activated novelty animatronic device. The sort of cheap toy they always have by the check-out counter at Walgreens—you know the kind of thing I mean. Like the talking wall trout, or the dancing Santa, or the wiggly Hillary Clinton. And in my plan I place this novelty device directly opposite the opening for the Litter Robot. Cats walk up to the opening and trigger the motion sensor, which makes the trout sing “Take Me to the River” or makes the Santa play “Jingle Bell Rock” on his saxophone and the cat says, “WTF? Okay I don’t know what that thing is, but I’m going to keep my eye on it.” So they step into the Litter Robot, and then TURN AROUND to keep tabs on the gyrating Hillary Clinton or whatever, and then everything goes where it’s supposed to go and the Litter Robot works and I’m a genius. So yesterday I went down to Walgreens to get a motion-activated novelty device. The kind of thing I have seen one thousand times and never wanted and always wondered, who would buy such a thing? But now I wanted one and guess what? They didn’t have any! Oh, they had saxophone Santas, but you had to push a button to make them start! Push a button, physically, with your own finger. Like it’s the 1800s or something. What happened to the breakthrough motion detector technology that makes scary plastic skulls scream at you on Halloween? Have we regressed? Apparently we have, because I walked all over the store trying to find just one damn undulating snowman, but found nothing. They are usually up at the front counter because they are an impulse buy. As I searched the entire store I could almost hear the Walgreens marketing guy saying, “You gotta put the Saxophone Santa up by the cash register. It’s an impulse buy. Nobody heads down to the store to buy one of these things on purpose.” Haha! Nobody does! You’re right! Except here I am. Today, I’m that guy. I woke up this morning and looked a the calendar and it said, “Today is the day you go get your talking trout!” So I packed up the baby in the Bjorn and headed down to the store to buy something that I have seen a million times and never wanted, but now I wanted it and I spent all day failing to get it, and my daughter watched the whole thing. I could feel her tiny brain re-evaluating my powers. Refusing to give up, I popped into Big Lots on the way home, but no. There were no trouts at the Big Lots either. Double failure. 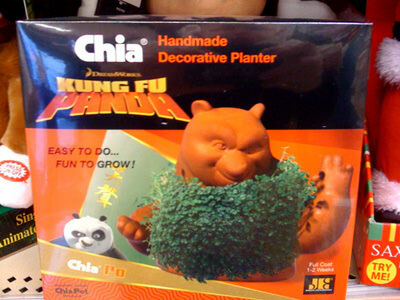 I did find a Kung Fu Panda Chia Pet, which is kind of Brütal Legend-related. Man, I hope we get Brütal Chia Pets! And then I found this. Who knew they had an Excellent Games section? And as I stood there trying to figure out whether to be happy because I had stumbled on to an old friend in an unexpected place, or to be sad because it was down to six bucks, Lili grabbed the box and put it in her mouth, and that made me happy, the end. "Ahh! I can not express how adorable your daughter is! She has great tastes in games too! (pun intended). She knew that her daddy made that game and therforth she figured it was awesome, and she was right! Once again, adorable child you have there! Keep her away from pirates though. They'll think she's cute too and will take her as their mascot!!" "I actually was pleasantly surprised by this as well! 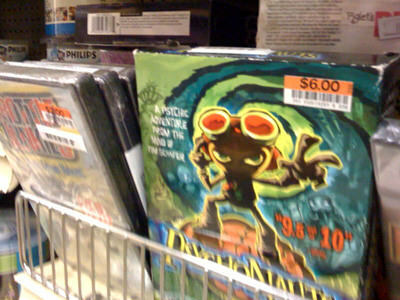 I stopped into my local BigLots (here in texas) and fount about 5 fresh copies of Psychonauts on the shelf (as well as a few copies of darwinia). I had played psychonauts, but I grabbed 2 copies for friends that had not. At the end of the week I returned for unrelated items, and every copy had sold. There was however a copy of darwinia left, which I purchased." "Hahahahahaha, I don't even care about Brutal Legend news now." "Okay, see, what you have to do is go to Goodwill or an Vietnam Veterans of America contracting thrift store. Garage sales are also very good, estate sales not so much. Make a day of it! You'll find a Big Mouth Billy Bass or a Cool Catfish or a Trevor the Trash Talking Trout or whatever, easy." "Man, that made me chuckle. Thanks!" "Your daughter has three hands. This could be a bad thing, but I've always found the third hand to come in very... um, handy." "The cat pee story makes me happy I have dogs. Although it did take one of my dogs literally months to figure out that he should pee outside. He once walked right into his crate, sat down, and peed right out the roof. And would not believe how big this guy's blatter is. He can literally pee for 4 minutes sraight at times. He's like a camel. But with a hump for pee instead of water. I bought a some copies of P-nauts from Big lots a few years ago. Thus allowing me to say I own a copy for every system available. Now all the stores around me no longer carry them. Bummer. Also, your daughter is adorable!" "is your daughter in a sheep costume? maybe thats why she wanted to eat the case...sheep will eat anything, or so i hear <_< >_>"
"So somewhere out there there's a copy of Psychonauts with Schafer DNA on it, and it's going for only $6?" "So can we buy the copy she chewed in the company store? Hey it's better than a signature! :)"
"You know, Metroid Prime, the highest-rated game of last gen, also costs $6. You're in the same league, Tim." "You'll be happy to know Psychonauts is still $25 here in good 'ol Sweden. I put one in my mouth too. Then I hugged it. :)"
"I think I know what someones getting for Christmas...."
"I would've signed it as well; I mean think about it; some random person see's this wonderful deal on this wonderful game and oh... it's signed by who? "Hey this person's name is in the credits!" Double wammy. Or sign it "BUY BTÜTAL LEGEND!" In big bold friendly letters." "your daughter seems very happy to get it and he's also very funny. hay day hack online"
"thats really fun story i like that..boom beach astuce"
"Ich komme aus Wisata Pulau Tidung und ich liebe, Spiele zu spielen, besonders, wenn die Spiele des Krieges. Mein Haus ist ein touristischer Ort, der es immer überfüllt mit Besuchern Tour, falls ich Spiele spielen gemacht hat. Für diejenigen unter Ihnen, die wollen, um sonstige Informationen zu erhalten, wo ich lebe Sie meinen Artikel via Titel Wisata Pulau Pari lesen wissen"
"At this time you can be you need to people I have to chat with; any blog indicate to the whole thing. You need a lot of calm masterpapers.com writers reviews and additionally from knowledge you’ve documented, you definitely be aware of to become a thing or possibly couple of regarding it. Dispatch others reminders using this delight." "A web logs are merely fantastic! I'm sure some essay mania service with the help of a good deal from past experiences in the region. Really easy to implement assert, every one typically the numerous years who Looking penning; May very well in no way and once read through some who teaches whatever I do your up to date blog page truly does. Regards for ones tribute!" "So lot to occur over your amazing blog. Your blog procures me a fantastic transaction of enjoyable.. Salubrious lot beside the scene. adonisgoldenratioreview"